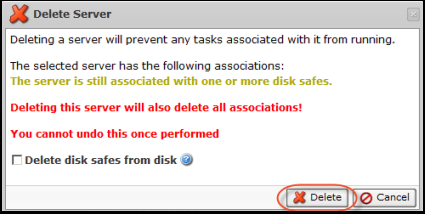 When you remove a Server from the Backup Manager, this may also delete all of the Server's Disk Safes for that Server. Deleting the Server will prevent any tasks associated with it from running. Click on "Servers" in the Main Menu (shown below) to open the "Servers" screen. In the Server list, click the icon [X] as shown in the picture below to remove the server you would like to delete. If your server does not have a backup yet, you will see the following screen appear. If you server DOES have a backup, you will see the following screen instead which warns that your server is still having backups in our backup server. If you remove your server instance from our backup server, all backups associating with your server instance will be detached from Backup manager. Your data will be left intact. NOTE: If you select "Delete disk safes from disk" along with the deletion of your server instance, your backups will be permanently deleted from our backup server. Click [Delete] to complete your action.